The decision to phase out Diablo also rankles those who see all non-carbon energy sources as critical in the fight against the real threat of climate change. This has led to an internecine dispute among those who claim the mantle of “environmentalist,” who are legitimately concerned about climate, but who split on their positions around the pros and cons of nuclear power. I get it. The climate threat is the most urgent one facing the planet and shutting down major non-carbon energy sources makes it that much harder to meet carbon reduction goals. But old nuclear plants have to be retired and replaced at some point, simply due to age, economics, and updated environmental challenges. It would be great if there was a new generation of replacement reactors that was safe, cost-effective, and reliable and if there was a satisfactory resolution to the problem of nuclear wastes and accumulating spent fuel. But at the moment, there isn’t. The good news is there are other non-carbon alternatives available. This time frame is important. When San Onofre closed its last reactor in 2012, with no formal replacement plan in place, there was a short-term spike in natural gas consumption (worsened by the simultaneous arrival of a multi-year drought, which cut hydroelectricity generation) and an increase in California’s greenhouse gas emissions. Nuclear proponents cherry pick this point as evidence that shutting Diablo will similarly lead to an increase in emissions. 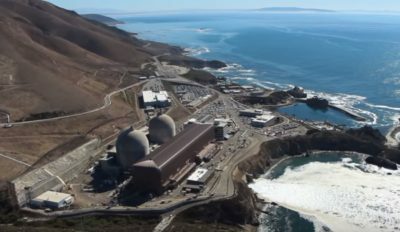 But within a couple of years, the rapid construction of non-carbon wind and solar systems made up for San Onofre’s lost electricity, and natural gas use — excluding excess natural gas burned to make up for lost hydroelectricity due to the drought –dropped again. The Figure below shows total non-fossil fuel electricity generation in California from 2001-2015 (solid red line) and what it would have been without the drought (dotted red line). Without the drought, expansion of new solar and wind completely made up for San Onofre’s closure. Total non-fossil fuel electricity generation with (solid red line) and without the drought (dashed red line). Data from US EIA. With the longer timeframe to prepare for closing Diablo Canyon, and with the specific agreement to accelerate investment in renewables, there is no reason California’s carbon reduction targets can’t be met. Will they? We don’t know: that ultimately depends on the nature and timing of efforts to continue California’s transition to non-carbon energy. But even this argument misses the key point: While it is certainly far better from a climate perspective to replace old fossil fuel plants rather than old nuclear plants, even old nuclear plants have to be replaced eventually. We should keep them open as long as feasible from an economic, environmental, and safety point of view, but when the decision is made to replace them, make sure other non-carbon generation and energy efficiency options are part of the decision. That’s what happened here and it is a model for the future.